We are a casual neighborhood place in Boston featuring 34 rotating draughts, elite bottled beers, cask ale, draught wine, craft spirits and custom cocktails. Our innovative menu is sure to please with an eclectic mix of traditional tavern favorites, burgers, sandwiches and flat bread pizzas. We offer an extensive brunch menu on both Saturday and Sunday that is out of the this world. 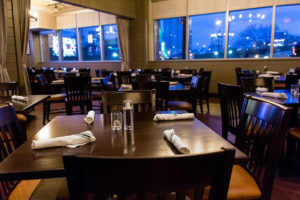 Blackmoor Bar & Kitchen is the perfect place to get a bite and beer before the game or show at the TD Garden (we’ve got discounted parking), or just relax with a pint and watch the sun set over the Zakim Bridge. We are located right along the Freedom Trail, close to the Navy Yard, across the bridge from Boston’s North End and a stone’s throw away from Cambridge’s Museum of Science. We welcome you to our cozy home. Groups and private events. We have an amazing view of the Zakim Bridge and the Boston skyline from our private event space. The room also includes its own TV which makes it great for business meetings, alumni groups, and sports events. Looking for a Gift Card? Click the button below! We are celebrating St. Patrick’s Day all weekend long! Click below for all the info!